Good book with some really complicated family dynamics adding to the obstacles between Deacon and Liberty. 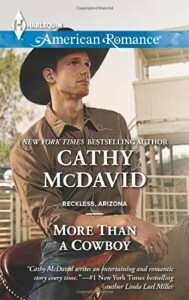 Liberty has spent her life believing that she is the product of a one night stand between her mother and a rodeo cowboy, only to find out that her mother has been lying to her. So she contacts Mercer to let him know that she wants to get to know him. Mercer comes to town with more than getting to know Liberty on his mind. Liberty had known Deacon when they were younger, before he left under a cloud of suspicion for causing a terrible accident on the ranch. Since then he has become a lawyer and returned to Reckless. He boards his horses on the ranch, so she sees him often. Her childhood crush on him is only getting stronger. But any chance of taking it further ends when Deacon becomes her father's lawyer in his looming battle with Liberty's mother. Deacon came back to Reckless for two reasons. First, to open his own law firm. Second, he wants a chance to clear his name, and being Mercer's lawyer will give him the chance he needs. Unfortunately, he doesn't count on the strength of the attraction between him and Liberty. But as her father's lawyer, starting a relationship with Liberty would create a conflict of interest that could wreck his career. I liked the relationship that built between Liberty and Deacon. Liberty never believed that he was responsible for the accident that everyone blamed him for, and that confidence in him helps to heal some of the hurt he still feels. Her feelings for him also motivate her to help him however she can in finding out the truth of what happened that day. I did think she was a little naive in thinking that they could be together without it affecting her relationship with her family. Deacon had been attracted to Liberty for awhile, but when the chance came to work with Mercer he took it because he needed the work. Now he struggles to do the right thing. When her father's manipulations come between them, both of them have to decide what is more important to them. I felt really bad for Liberty and the things she had to put up with from her family. Both her parents were selfish and manipulative, even though they claimed they were doing things for the right reasons. Liberty had every right to be angry about the way her mother lied to her. However, her father also used her as a way to get back involved with the ranch. I thought he was a bully as well, with the way he would force everyone to go along with what he wanted. I liked the way that Liberty at least wanted to give him a chance. That was quite a contrast with the sheer stubbornness of her mother and her sister. Though there was some progress made in repairing the relationships, I feel like the two parents still have a long way to go. I liked the fact that the mystery of the bulls was solved by the end of the book. As Deacon's investigation progressed, there were some interesting facts that came to light. Liberty seemed to put the pieces together faster than Deacon did. I loved seeing that Deacon's honorable nature had him helping his accuser, even though he didn't have to. It certainly helped him in the end.